It's been a while since the last post, between University and practicing development - I had neglected to continue the blog. This time around - I'm looking to keep it going so long as my schedule allows, at least for the sake of reflection. Together with RPG Maker VX Ace, I had been looking into pixel art. 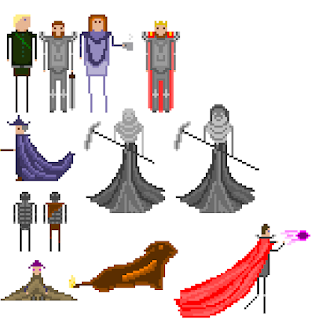 Likely many of you are already familiar with pixel art, if not, here are some examples of some I have made from practice. Needless to say I am a novice at this and I am still learning the ropes so to speak - but it should give you a good idea. These are a few character sprites that I have made that took roughly 5 minutes to 45 minutes to create for different ones. Needless to say, practice and persistence is important. As I come from a Business background, less so an Art's background, the challenge was bringing what I had in mind reflected in the pixel art. This gets easier I found as you get better at the skill, but techniques and practice coupled with some online tutorials that might give you a nudge in the direction that you are looking to move towards will help. The program I used to create these was Graphics Gale. Graphics Gale is a pixel arts software which I found to be very good for the task. It is designed towards creating pixel art, and on top of that, has a fairly cheap price of around 15 Euros. You can always give the trial a go to check whether the software is something you would like to purchase. You can, needless to say, use other software such as GIMP and Photoshop - I simply found this software fairly nice to work with, not to mention it comes with the added flexibility to help you animate using frames, which I have yet to toy with. In terms of tutorials I would recommend achebit on Youtube. His tutorials have aided me in getting the small nudges I needed to start trying out pixel art characters, something which I avoided for the longest time. Depending on what you are looking to learn and do with pixel art - whether it is characters, textures, tiles or scenery, there are numerous tutorials available online. Pinterest I found is quite full of them such as Shel Shel - Pixel Art Textures and Dibujo - Pixel Art Tree. So check these out if you are interested and feel free to share any other tutorials you found to be helpful! 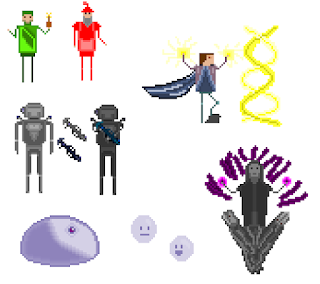 That's all I have for now about Pixel Art, give it a try - it is really fun, and will be a major skill and asset to have should you ever try to develop a game using pixel art!